Hardware development is never easy. Neither is brand and/or company building. Fortunately, in this (brave!) new work world, everything- from building a global brand out of your bedroom to high-tech hardware innovation, got more accessible and therefore within reach of thesmart, but not too professional. People that we call professional amateurs. We as Tatcraft with all its entities embraced new work as well as lean management/ computer aided design/ flat hierarchies and rapid prototyping. To name a few. We are still not there, wherever that is, but this journey led us to ownership of 5+ companies and 26 consulted within the last 18 months. Impressive, no? No bragging, friend. Just that you know we’re not complete idiots, trying to sell you stuff that we have no clue about. So, why are we telling you? We built a program of which we think you could very well profit from. We don’t care about stages. You’re a fabricator and in need of high-tech workshops? Fine! You want to hang with other makers? Fine! Want to learn how to design for manufacturing with our team of designers. Let’s go! You’re a startup in need of small batch manufacturing partner or know how? Done! You’re a SME, and you’re here for tech support and new work age marketing. Hi! You’re an professional amateur who’s going all the way? Even better than fine! Got it? Jump just right in into our program. We don’t invest (most of the time). First of all, Tatcraft is a project growth network- therefore you’ll profit from a true and tested network of startups / designers / manufacturers & makers of all couleurs. If anything, we’re transparent. Most of the time you’re going to pay for services rendered. That way everything stays nice, tidy and professional and you can be sure we’re not out chasing your equity and there’s no catch. Remember there is no thing such as a free lunch. We own one of largest manufacturing-oriented makerspaces in Europe. Want to build? The Tatcraft Makerspace is the right place for you! You want to iterate your idea? 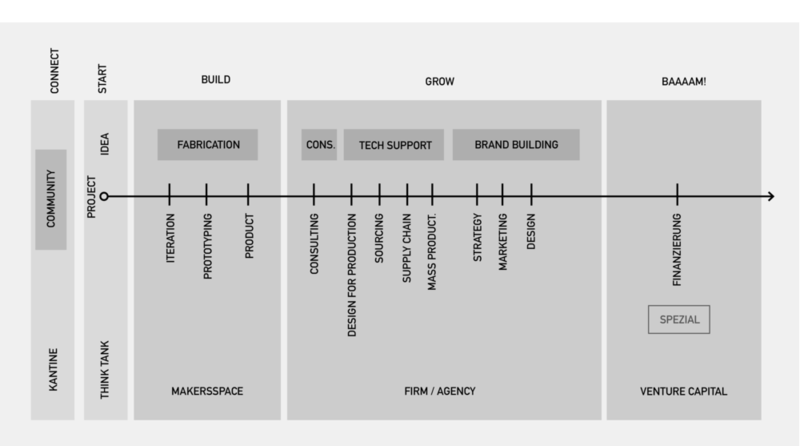 You’re prototyping a product or assembling your last production batch? Tatcraft Firm is one hot and exciting mixture of project management / engineering consulting / manufacturing services / brand building agency. We’re inhouse a lot of our time but also out there inventing, creating and building serious projects with our partners all the time. Would be great to help you grow, too. Craftakt (denglish wordplay: craft + german word Kraftakt which means strenuous effort) is an initiative, that we had a long-time brewing. Together with the City of Frankfurt and other high value partners we host a conference as well as a series of events. In addition to that, a group of handpicked few startups are being selected to enjoy the benefits of our program in form of financial aid for manufacturing, sales and communication services. The rare, the truly few. There are some startups, that are just perfect fits. Also, there’re some makers some truly gifted that also fit to our plans. Then, and only then we’re considering venture, spin offs and coops. That might be expanding soon, but right now we’re pretty much happy with things how they are.